Our robust online tools allow you to uncover your best donors and prospects. Summarize, analyze and filter results utilizing our Keyword Search and Executive Analysis functionality. DonorSearch provides accurate and actionable data and allows you to identify your best prospects based on proven philanthropy and wealth analytics. DonorSearch offers a variety of ways to search for the information your organization needs. Looking to build out a profile on an individual? Turn to our Integrated Search. Interested in finding grant giving organizations? Try our Search Options. Is your organization trying to acquire new donors? Use our Marketing List. No matter what information you’re looking to find, DonorSearch has a search tool for you. A one-by-one look up module which generates a detailed profile on prospects or donors. This includes wealth and philanthropic information with relationship mapping. Direct access to the largest philanthropic database. Find giving connected to foundations, organizations, or an individual. Browse DonorSearch databases including foundations, businesses, SEC insiders and real estate for connections, locations and giving. Create hyper-targeted marketing lists based on over 300 financial, demographic and interest categories. Search and filter by geography, home value, wealth markers, hobbies, interests and more. Mail confidently knowing that your recipients care about causes just like yours. Find prospects and research both traditional wealth markers and philanthropic activity, including: Wealth information that shows ability to give, Philanthropic activity that shows past giving, including year, amount, type, recipient and other data, and NonProfit affiliations. Unlock key insights for your organization using DonorSearch’s premier analytics capabilities. 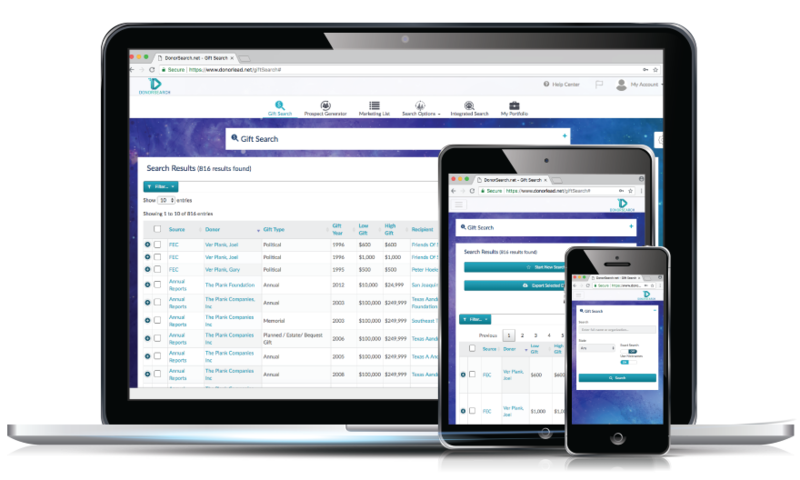 Whether you want a complete snapshot of the potential within your database using our Executive Analysis or you want to identify a single organization receiving a gift within your screening results by utilizing our Keyword Search, DonorSearch provides you the flexibility you need. The Executive Analysis report is a visual representation of data identified during the screening and research process. Over 12 customizable reports are available for understanding your donors’ affinity, capacity, interest and location. Keyword Search allows you to quickly filter your screening and/or search results into specialized causes, beyond the standard Interest Category. Approach your upcoming campaign with a strategic plan and heightened focus. Now you can see exactly where your major donors are located and plan your visits accordingly. What’s better? We utilize a Google Maps integration so you can literally see the street level view of your donors. Create heat maps in donor-centric areas, use advanced filters to customize the type of donors you want to visit, and more. After screening records with DonorSearch, your organization will acquire advanced analytics that will help you identify what type of prospect you might be looking at. Start with our RFM score that uses three different criteria to determine how effective of a prospect they are to your organization. Then dive deeper into our Major Gift Likelihood, Annual Fund Likelihood, as well as our Planned Giving Prospect Identification score to see what type of gift your organization should be asking for. Have complete control over the way you use your account. Enjoy customizable layouts within ProspectView Online to do prospect research on your terms. Or create a master account that you control and customize what others with sub-accounts are able to access. Don’t let your prospect research tools inhibit you from achieving your fundraising goals. Using DonorSearch’s ProspectView across your shop has never been easier. Now, under your consultant’s master account, you can take advantage of our powerful prospect research suite at value pricing. Our online tool and profile are now easily customizable! Whether it’s a different view of ProspectView Online you’re interested in, or a personalized profile layout, design is now in your hands.